Allen Delais’s memories are elusive, inseparable from his dreams. He remembers a home but not how to get there, and he wants to go back. All he has to give him a clue is a divine Mark beside his left eye. Three and a half years later, he’s no closer to an answer. In the meanwhile, he’s earned a commission for himself in the King’s Griffins, the elite core of the royal legions. A chance event brings him to the king’s attention, and it seems the divine has a plan in store for him as well. The nobles in the kingdom are plotting treason, other kingdoms are on the move, and a dark god is turning his eye to expanding his territory. Allen Delais manages to find himself at the center of it all, struggling to keep the peace. But his real job isn’t for the king. It’s for his goddess. A Northern Heart has not been tagged yet. Help others find A Northern Heart by tagging it! 9 chapters in and the author hasn't updated in a while. I'm not sure I would recommend this to anyone just yet, but if the author had to come back, I would certainly read a bit further. The start is slow and nothing much happens. The writing is passable but could do with some tightening up. That being said, just enough hints at a story and pending adventure make me want to keep on reading. 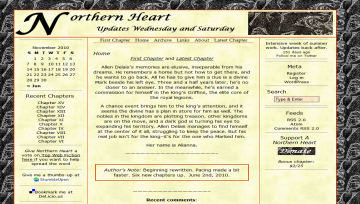 A Northern Heart has not been recommended yet.